The ‘M’ series of products have been designed to withstand the harshest of environments. Constructed from lightweight, impact and fire resistant ABS, the range features stainless steel, ratchet adjustable mounting brackets and has been third party tested to IP67. – Sound Frequency: 45 tones, including ISO tones to Australian Standards (see tone table in attached pdf). – Sound Output: Max 119dB @ 1m. – Automatic synchronization on multi-sounder systems (requires sounders to be connected to the same supply). – Volume control (112dB max. – 100dB min on tone 2). – Three stage alarm (reverse polarity stage switching on DC units). – Temp Rating: -25 to +55 degrees Celsius. – Cable Entry: 2 x M20. – Construction: Flame retardant ABS. 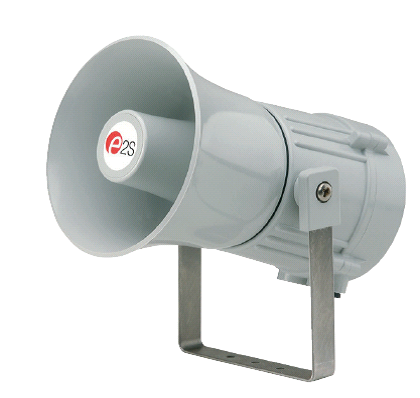 ESS5312 MA112 sounder, 10-30VDC, 200mA @24VDC. ESS5313 MA112 sounder, 24VAC +/- 10%, 500mA. ESS5316 MA112 sounder, 35-60VDC, 120mA @ 48VDC. ESS5321 MA112 sounder, 115VAC +/- 10%, 100mA. ESS5331 MA112 sounder, 230VAC +/- 10%, 60mA.